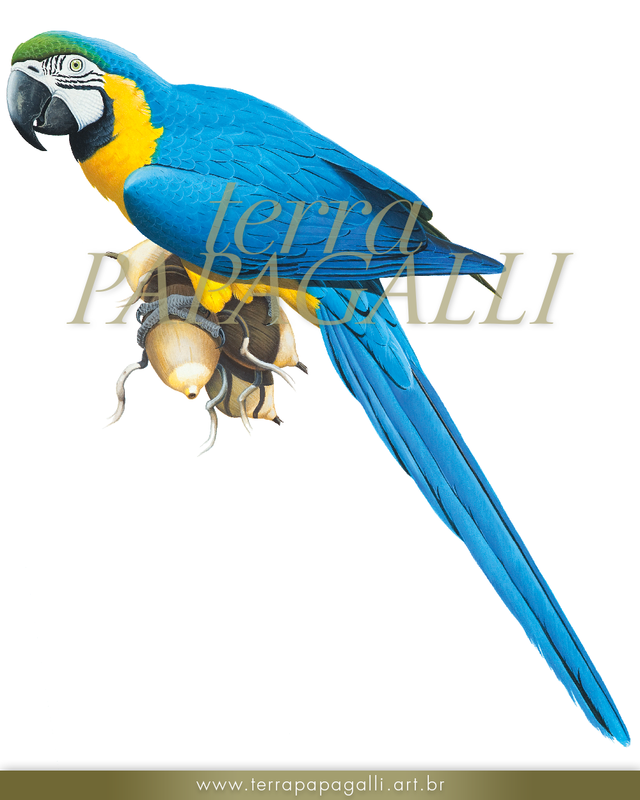 The biggest artistic-scientific survey ever conducted containing all 91 species of Brazilian parrots. 376 pages richly illustrated with reproductions of the original paintings and details never seen before. INTERNACIONAL SHIPPING. BUY WORLDWIDE WITH PAYPAL. 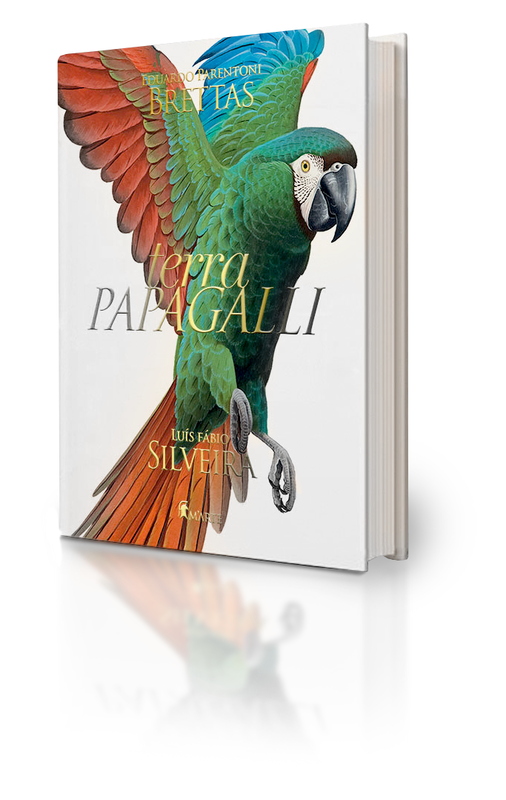 Terra Papagalli brings the biggest artistic-scientific survey ever conducted, containing all 91 species of Brazilian parrots. All species are finely painted by Eduardo Parentoni Brettas, one of the most gifted painters of birds of Brazil, under the scientific guidance of one of the leading Brazilian ornithologists, Prof. Dr. Luís Fabio Silveira, curator of the bird collection of the Museum of Zoology of the University of São Paulo (MZUSP), the largest collection of Brazilian birds in the world. The historical significance of the name Terra Papagalli is intertwined with the history of the discovery of Brazil. The first Portuguese explorers marveled with the magnificent Scarlet Macaws baptized the land Terra Papagalli (Land of Parrots, in latin) in the years following the discovery of Brazil. The book is written in Portuguese and English and has 376 pages richly illustrated with reproductions of the original paintings and details never seen before, plus information on each species' diet, nesting areas, locations most suitable for the observation of species in the wild in Brazil and much more. The status of conservation of each species is also provided, as well as various indexes for navigating the work such as by scientific name, popular name in Portuguese, popular name in English as well as by Genus. Eduardo Parentoni Brettas was born in the city of Ponte Nova, Minas Gerais, Brazil, in 1962. His first drawings of birds date to his childhood spent in the lush nature of Brazil. His first great supporter was his mother, Indiana Parentoni Brettas, who encouraged her son to become a master painter of nature. His works have been commissioned by the great centers of ornithological studies, including the University of São Paulo in Brazil and Princeton University in the United States, and are displayed in museums and art galleries in Atlanta, Dubai, Rio de Janeiro, Belo Horizonte, and elsewhere, as well as private collections around the world. Eduardo regularly teaches courses and lectures on naturalistic art, in which he generously shares his talent and technique with professional and amateur artists. Eduardo lives and works in Juiz de Fora, Minas Gerais, where he lives with his wife, Vanessa, and his two sons, Tiago and Ricardo. Luís Fábio Silveira was born in the city of Belo Horizonte, Minas Gerais, Brazil, in 1974 and received his PhD in Zoology from the University of São Paulo (USP) in 2003. A born scientist with a passion for birds since childhood, Luis Fábio is curator of the bird collection of the Museum of Zoology of the University of São Paulo (MZUSP), the largest collection of Brazilian birds in the world. Having published more than 100 scientific papers and 14 books, he is one of Brazil’s most important scientists conducting research on ornithology. Brazil is home to the greatest diversity of birds in the world, with more than 1900 known species, and Luís Fabio’s work has contributed to countless public and private initiatives aimed at conserving and managing this diversity. He also advises master’s and doctoral theses at USP, thereby contributing to the formation of the next generation of Brazilian and foreign scientists specialized in the study of Brazilian birds. When he is not conducting field expeditions throughout Brazil, Luís Fábio is based in the city of São Paulo, where he lives with his wife, Érika. Thank you! Our staff will contact you soon!